Jimenez's jig, Hahn's 'Gangnum' and Olazabal's memorable Ryder Cup dance are among the moves being scrutinised by special studio guest Anton Du Beke. His overall verdict? Frightening! With Strictly Come Dancing legend Anton du Beke as a special guest in the Sky Sports studio, we could not resist the temptation to get his opinion on a number of famous golfing dancers. There have been several memorable moves on the fairways and greens over the years, and Anton was particularly impressed by the "natural" moves of Miguel Angel Jimenez, who celebrates his many aces and hole-outs with a signature dance while holstering the successful club. Sky Sports' own Rich Beem enjoyed a jig when he holed out for victory at the 2002 PGA Championship, while James Hahn's version of the "Gangnum Style" dance at the Phoenix Open soon went viral on social media. 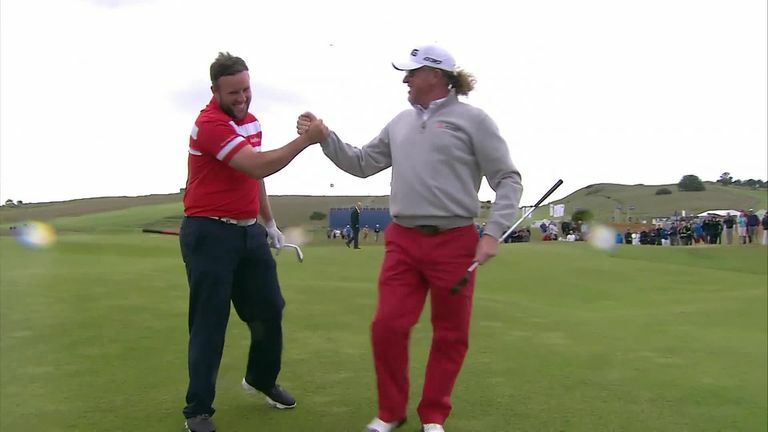 Phil Mickelson earned many plaudits for his infamous moves in an advert for his clothing sponsors last year, but Anton was less enthused by Andrew "Beef" Johnston's attempt at emulating the Jimenez dance. Strictly Come Dancing legend Anton du Beke is an accomplished golfer, but could be beat David Howell as they took on the iconic par-three seventh hole at Pebble beach in the Shot Centre? But perhaps the most famous dancing moment from a European perspective was Jose Maria Olazabal celebrating a historic Ryder Cup victory in true Spanish style at Muirfield Village in 1987, although Graeme McDowell's bid to emulate his captain after the Miracle at Medinah in 2012 is unlikely to earn him an invite to the next series of Strictly! 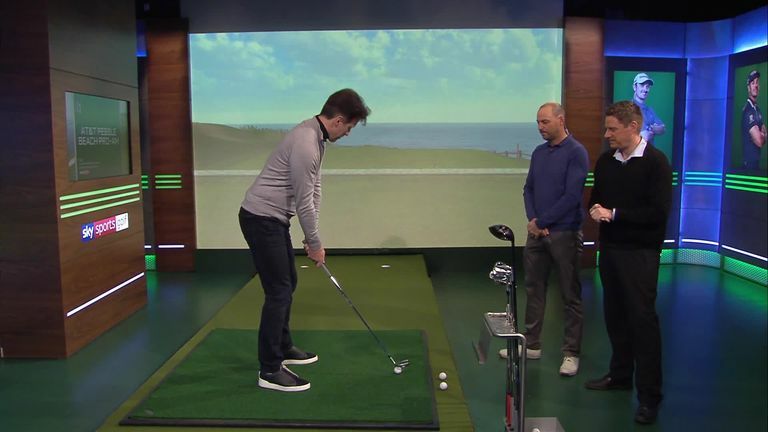 Meanwhile, Du Beke also had the chance to show off his golfing prowess in the Shot Centre, but could the single-figure handicapper and Wentworth member beat European Tour pro David Howell in a nearest-the-pin challenge? Find out as Anton and David took on the seventh at Pebble Beach, and don't miss continued live coverage of the AT&T Pebble Beach Pro-Am throughout the weekend on Sky Sports Golf.